This month the Health and Safety Executive (HSE) is due to publish its latest 2019/20 Business Plan, detailing how upcoming annual priorities will support its mission ‘to prevent death, injury and ill health in Great Britain’s workplaces’. In anticipation of the HSE’s plan publication Heightsafe is calling for a renewed focus on tackling the number of preventable deaths and injuries as a result of Working at Height. From 2013-18 falls from height accounted for the majority of fatal injuries to workers – at an average of 37 deaths every year. It is a major killer of workers in key sectors including construction and agriculture. 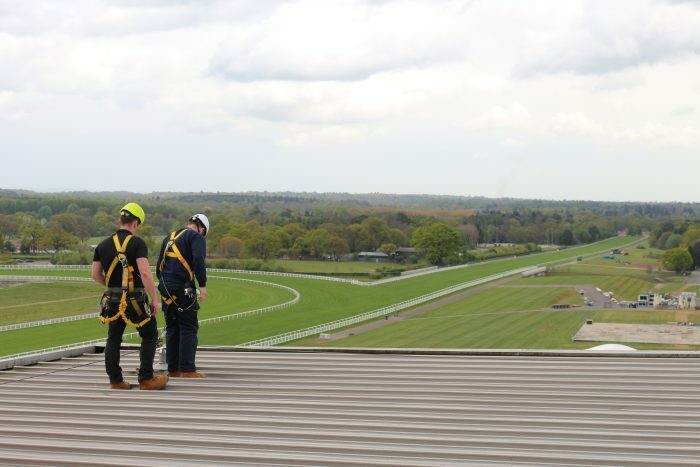 Heightsafe providing specialist Work at Height training for Ascot Racecourse. Last month the All-Party Parliamentary Group (APPG)’s report on Working at Heights, put forward recommendations to highlight the risks, regulations and best-practices to a variety of industries, demonstrating the need to improve knowledge and preventative action across the UK workforce. In the HSE’s 2018/19 plan, published in March 2018, its priorities under the Health and Work programme gave focus to reducing levels of occupational lung disease, musculoskeletal disorders, and work-related stress. Despite falls from height accounting for the highest number of fatal injuries in the workplace, no mention was made of tackling this specific issue in last year’s plan. “We very much applaud and support HSE’s focus on tackling serious issues of lung and musculoskeletal diseases and stress. However, we are concerned that in the drive to solve these complex issues the HSE may be losing strategic focus on making sure the basics are done right,” said Ken Diable, Managing Director at Heightsafe. “Falls from height account for the majority of fatal accidents at work. These deaths are, for the most part entirely preventable which makes these incidents completely unacceptable. In our ten years in the Health and Safety industry, despite the various fall protection equipment available to prevent these deaths, there is still a lack of education and understanding of how dangerous Working at Height can be,” Diable added. The fatal injury rate in construction (1.64 per 100k workers) is around four times the all industry rate. From 2013-18, 47% of deaths in the construction industry were as a result of a fall from height. In the same period, falls from height were also the third most common cause of deaths in the agricultural sector. Over the last 35 years this sector has demonstrated a fatal injury rate of around 20 times the average. Both construction and agriculture are sectors dominated by SME organisations, which the HSE says are hard to reach with appropriate messaging around safe working. “Workers in construction and agriculture are risking their lives just by going to work, which is completely unacceptable,” commented Diable. “My fear is that with continued budgetary cuts for HSE, focus on communicating the basics of proactive safe working will lessen even further. While it will continue to investigate and enforce, these actions are not preventative – it’s shutting the door once the horse has bolted. My fear is that the preventative campaigns the HSE has previously invested in will wither further. Furthermore, stretched employers, particularly these SMEs in high risk industries will forget that doing the basics right saves lives,” concluded Diable. For interviews or high-resolution images please contact Heightsafe’s Head of Marketing via email india.ikonomides@heightsafesystems.com or call +44 (0)20 3819 7199. Heightsafe Systems has grown exponentially in the ten years that it has been trading and are now an established and trusted market leader in the Work at Height Industry. The family business employs over 50 full time team members, including two apprentices across five UK offices, striving to strengthen health and safety culture for clients nationwide – including blue-chip clients such as Whitbread, Selfridges, John Lewis, XPO Logistics, Travelodge, Kier Construction, Berkeley Homes and Bouygues. Their wide range of specialist Work at Height products have been designed, developed and manufactured at Heightsafe Systems’ Head Office in the North West, with a focus on products and materials being sourced sustainably and responsibly. Products and services include: Fall Protection Systems, Façade & Roof Access Systems, Lightning Protection Systems, Work at Height Compliance, Training, Fabric Maintenance and Rope Access.